As you know, most fuel cells use hydrogen as a basic fuel—either directly or by reforming a fossil fuel. There are five important types of fuel cells, and each has a different chemistry. Some types of fuel cells work well for use in stationary power plants. Others may be useful for small portable applications, others for vehicle applications; they are particularly suited for applications in which pollution-free vehicles are needed. In this section, the five most important types of fuel cells are discussed. Various types of fuel cells differ primarily by the electrolyte and catalytic electrode used. Selection for a particular application depends on criteria such as cost, efficiency, weight, fuel storage, and so forth. The primary types of fuel cells discussed in this section are the proton exchange membrane fuel cell (PEMFC), direct methanol fuel cell (DMFC), alkaline fuel cell (AFC), phosphoric acid fuel cell (PAFC), solid oxide fuel cell (SOFC), and molten carbonate fuel cell (MCFC). The PROTON EXCHANGE MEMBRANE FUEL CELL (PEMFC) is also called a polymer electrolyte membrane fuel cell. A polymer is composed of molecules with a high molecular weight that can be formed by the addition of many smaller molecules. The PEMFC uses hydrogen fuel and oxygen (obtained from the air) as an input and produces pure water and electricity. It has a high power density and high operating temperature of 50° C to 100° C (122° F to 212° F) and the electrolyte is a polymer membrane (hence the alternate name). It has a wide range of efficiency (25% to 58%). It warms up and begins generating electricity quickly, which makes it very useful in transportation vehicle applications. General Electric developed the first proton exchange membrane fuel cells for the Gemini space missions in the early 1960s. PEMFCs were replaced by alkaline fuel cells in the Apollo program and in the space shuttle program. Prior to the PEMFC, fuel cells were used only in special applications where remote electrical power was needed. These early fuel cells were solid oxide types that required very expensive materials and could be used only for stationary applications due to their size. Their operation also required large budgets. When the PEMFC was first designed, it used sulfonated polystyrene membranes for electrolytes, but later they were replaced by solid organic polymer polyper fluorosulphonic acid, which has proved superior in performance and durability. Figure 1 shows a diagram of a PEMFC. The electrolyte in the PEMFCs is a solid polymer. The electrodes use porous carbon that contains a platinum catalyst. The fuel cell uses either pure hydrogen from storage tanks or from reforming a hydrocarbon fuel with an onboard reformer. In Figure 1, hydrogen gas is input to the cell, where it reacts with the anode, which in turn releases electrons as current. The cell needs oxygen, but it can be extracted from the air and it does not require corrosive fluids. Oxygen from the air reacts with the remaining hydrogen ions to produce water (water and heat are by-products). The PEMFC is lightweight compared to other fuel cells and produces sufficient power to be useful for providing power for vehicles. The PEMFC is also used for stationary applications. One disadvantage is that, if onboard hydrogen is used, it must be stored as a compressed gas in pressurized tanks. In this form, it is not possible to store enough hydrogen to travel over 300 miles in a vehicle, so this technology cannot compete with traditional gasoline- or diesel-fueled vehicles at this time. If onboard reformers are used, higher-density liquid fuels, such as methanol, ethanol, natural gas, liquefied petroleum gas, and gasoline, can be used to provide the hydrogen. The onboard reformer is expensive and has additional costs, including maintenance; however, it is used in a number of applications. The DIRECT-METHANOL FUEL CELL (DMFC) is a subcategory of a proton exchange membrane fuel cell. This fuel cell was invented by college researchers in cooperation with the Jet Propulsion Laboratory (JPL) in 1990. Figure 2 shows a diagram of the DMFC. It uses a polymer electrolyte similar to the one in the PEMFC. Methanol is used as the fuel, and hydrogen is separated by a steam reformer. 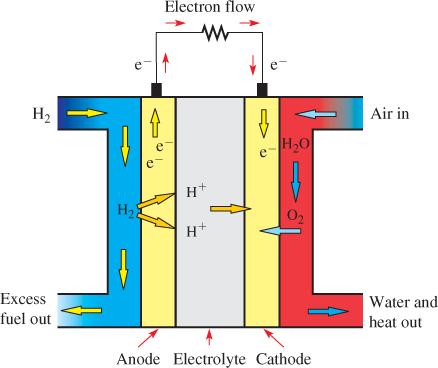 Methanol and water are supplied to the fuel cell, as shown at the bottom left of the figure, and they react with the anode. Hydrogen is extracted from the methanol, and electrons from the hydrogen are free to flow as current out from the anode and return back through the cathode. Oxygen is supplied through the air and is ionized at the cathode. Oxygen ions combine with hydrogen ions to make water. The operating temperature range of this fuel cell is about 50° C to 120° C (122° F to 248° F). Typical units have a power rating between 25 W and 5,000 W.
The direct methanol fuel cell can be used in vehicles because it uses methanol in liquid form to provide the hydrogen source. Lower operating temperatures mean that this fuel cell does not need a large, heavy heat shield. A disadvantage is that the efficiency is low, so the DMFC is more suited for portable applications, where energy and power density are more important than efficiency. Another disadvantage is that carbon dioxide is a by-product and it is released into the atmosphere, just as it would be from the combustion of methanol. The ALKALINE FUEL CELL (AFC) is a very efficient fuel cell that requires pure hydrogen fuel and pure oxygen. It uses an aqueous (water-based) electrolyte solution of potassium hydroxide (KOH) in a porous stabilized matrix. AFCs have been used in the US space program since the 1960s to produce electricity and fresh water for spacecraft. The Apollo missions and the space shuttle used alkaline fuel cells to produce electrical power and fresh drinking water. The AFC is very susceptible to contamination, so it requires pure hydrogen and oxygen, which makes this fuel cell expensive to operate and limits its application. Figure 3 shows a diagram of the AFC. 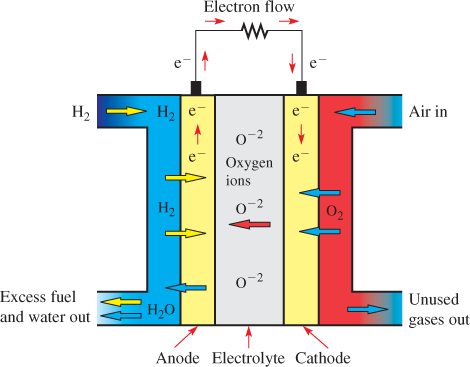 Pure hydrogen is supplied to the fuel cell at the anode, and pure oxygen is supplied at the cathode. The anode and cathode are made of lower-cost, nonprecious metals such as nickel. The electrolyte is a solution of potassium hydroxide (KOH) in water, which ionizes to form potassium ions (K+) and hydroxyl (OH−) ions. In the AFC, hydrogen gas is oxidized to hydrogen ions and combines with the hydroxide ions, which produces water (H2O) and releases two electrons. The electrons flow through the external circuit and return to the cathode, where they reduce oxygen to form more hydroxide ions and water. The AFC operates at temperatures of 100° C to 250° C (212° F to 482° F). More recent AFCs operate at temperatures of 23° C to 70° C (74° F to 158° F). This fuel cell has an operating efficiency of 60% to 70%. Excess heat is removed from the fuel cell as a by-product, and it is hot enough to provide steam to power a steam turbine. The heat can also be used to heat buildings. The AFC fuel cell works well in spacecraft or in undersea locations where the atmosphere can be controlled. A disadvantage is a requirement for pure oxygen and pure hydrogen, and both gases must be supplied continuously. The fuel cell is also poisoned easily by carbon dioxide (CO2), which affects the cell’s lifetime. AFCs do not currently have lifetimes beyond about 8,000 operating hours, so they tend to be less cost-effective than other types. The PHOSPHORIC ACID FUEL CELL (PAFC) is equivalent in structure to the proton exchange membrane fuel cell (PEMFC), but it has liquid phosphoric acid as the electrolyte. The electrolyte is contained in a Teflon-bonded, silicon carbide matrix. It uses an external reformer to separate hydrogen from a hydrocarbon fuel. PAFCs are typically used in small, stationary, power generation systems, but research is being conducted for application in larger vehicles such as buses. The PAFC operates at around 150° C to 200° C (300° F to 400° F). This operating temperature is hot enough to provide external heat as well as electricity. If gasoline or diesel is used as a basic fuel, sulfur must be removed from the fuel prior to use or it will damage the electrode catalyst. PAFCs are more tolerant of impurities in fossil fuels that have been reformed into hydrogen than are PEMFCs. The electrical efficiency for PAFCs is 40% to 50%, and when the energy produced by the waste heat is considered, the efficiency rises to about 80%. Today, PAFCs are used in commercial electrical production. The PAFC can tolerate a concentration of carbon monoxide (CO) of about 1.5%, which is a larger concentration than can be tolerated by other types of fuel cells. Another advantage to the PAFC is that the phosphoric acid electrolyte can operate above the boiling point of water. A disadvantage of the PAFC is that, when compared to other fuel cells of similar weight and volume, it produces less power. Also, PAFCs are expensive because of the platinum catalyst and the need for corrosion-resistant materials (because of the acid). The SOLID OXIDE FUEL CELL (SOFC) is named for the solid oxide electrolyte used. The solid oxide electrolyte consists of Yttria-stabilized zirconia, a zirconium oxide–based ceramic. Figure 4 shows a diagram of a standard solid oxide fuel cell. 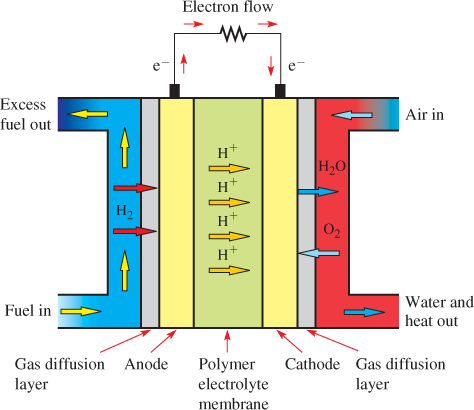 Hydrogen fuel (H2) is applied to the anode, which is oxidized to hydrogen ions. The electrons are given off to an external circuit as electrical current. The electrolyte is a hard, nonporous solid oxide that allows only the oxygen ions (rather than hydrogen ions) to pass and blocks electrons. A traditional SOFC must be operated at high temperatures (800° C to 1,000° C) to achieve reasonable conduction of the oxygen ions. In the traditional SOFC, air is taken in so that oxygen (O2) can diffuse through the cathode. The unused gas is routed out of the cell. The fuel cell produces water, which must be taken out of the cell. The solid oxide fuel cell takes several minutes to come up to temperature before it can produce power continuously to the external circuit, so this type of fuel cell is not useful for applications where it needs to be turned on and off frequently. It also produces a large amount of heat in the electrochemical reaction, and this heat must be removed from the fuel cell to ensure that it operates safely. The high operating temperature allows the SOFC to separate (reform) hydrogen from other fuels internally so that expensive reforming equipment is not needed. SOFCs were first designed in the 1930s and have been improved over the years. Two major improvements have been announced by Department of Energy’s Pacific Northwest National Laboratory (PNNL). A small SOFC with up to 57% efficiency is the first breakthrough. It uses methane (CH4) fuel that is reformed and cleaned. This solid oxide fuel cell can generate between 1 and 100 kW of power, making it useful in smaller applications. The second major breakthrough for SOFCs is an electrolyte made of scandium in cubic zirconia, which can pass oxygen faster and at temperatures far lower than older SOFCs. The anode has traditionally been made of nickel; however, some new composite materials made of oxides of strontium titanate and ceria can replace the traditional nickel. An SOFC can use hydrogen and carbon monoxide as fuel. It can also run on other common hydrocarbon fuels such as diesel, natural gas, gasoline, or grain alcohol. Some versions are being tested to operate with coal. An advantage of the SOFC is the solid electrolyte, which does not require a pump to circulate the hot electrolyte, as in some other fuel cells, and fuel is reformed internally. In addition, SOFCs do not require the expensive platinum catalyst that is needed in other fuel cells. The SOFC tolerates sulfur in fuels better than other fuel cells, has a resistance to carbon buildup and is not poisoned by carbon monoxide (CO). Another advantage of SOFCs is that the hard, nonporous ceramic electrolyte can be shaped like cylinders rather than the plate-like the configuration of other fuel cells. Figure 5 shows a diagram of a solid oxide fuel cell in a tube structure. A disadvantage of the SOFC is that the ceramic parts cannot withstand heating and cooling cycles very well. Another disadvantage is that the SOFC requires heat shielding, which makes it too heavy to use in some lighter transportation systems such as cars, although it is being investigated for use in trucks. The molten-carbonate fuel cell (MCFC) is similar to the solid oxide fuel cell (SOFC), but it uses carbonate ions as the charge carrier in a high-temperature liquid solution of lithium, potassium, or sodium carbonate as an electrolyte. The MCFC operates at a temperature of 600° C to 700° C (1,112° F to 1,292° F), so it can generate steam that can be used to generate more power. It is best suited for large stationary power generators. Because the MCFC has an operating temperature that is a bit lower than solid oxide fuel cells, it can use less exotic materials, which makes it a little less expensive to manufacture and operate. The MCFC was first designed in the early 1930s along with the SOFC. Research on both devices continued to provide improvements until the 1950s when researchers found that fused molten-carbonate salts could be used as an electrolyte in the fuel cell. Because MCFCs operate at extremely high temperatures, nonprecious metals such as nickel can be used as catalysts in the anode and cathode, rather than the platinum that is used in some other fuel cells. Figure 6 shows a diagram of an MCFC. Hydrogen is ionized at the anode by the catalyst. After the carbonate ions (CO−23 pass through the electrolyte, they combine with the hydrogen ions (H+) to form water (H2O) and carbon dioxide (CO2), which is returned to the input. The carbon dioxide and electrons from the external circuit combine with oxygen to supply more carbonate ions, and the process continues. The net reaction is hydrogen plus oxygen, which produces water as in other fuel cells. High-temperature MCFCs can extract hydrogen from a variety of fuels, such as natural gas, diesel, or coal, and they are not subject to the contamination issues of other types of fuel cells. Because the MCFC operates at very high temperatures, these fuels can be converted to hydrogen within the fuel cell itself without a separate reformer, which also reduces cost. An important advantage of an MCFC is that it can be used as a large stationary power plant that can supply power to the main load or at peak times as needed. In addition to its ability to use various fuels, these plants are clean and quiet. The fuel cell can be placed close to the point where it is used, so it allows electric companies to provide electricity without a large investment in transmission lines. One other advantage of MCFCs is that the waste heat can be captured and used, thus raising the overall efficiency. One major disadvantage of molten-carbonate technology is that it is more difficult working with a very hot liquid electrolyte rather than a solid electrolyte. Another disadvantage is that the chemical reactions at the anode use carbonate ions from the electrolyte, making it necessary to inject carbon dioxide at the cathode and thus requiring a supply of carbon dioxide. Table 1 compares specific parameters—the electrolyte, operating temperature, and electrical efficiency—for the fuel cells discussed in this section. What are attributes necessary for the anode of a fuel cell? Why isn’t hydrogen considered a primary fuel source? What type of reaction always takes place at the anode of a fuel cell? How does a PEMFC produce electrical power? What is an advantage to the high-temperature operation of an SOFC? How does an MCFC differ from an SOFC? 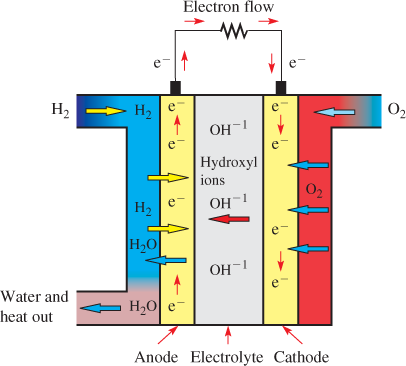 The anode needs to be a porous conductor that facilitates the oxidation of hydrogen. It does not occur naturally on earth but is the product of a chemical reaction. The PEMFC uses pure hydrogen and air (oxygen) as inputs and oxidizes hydrogen at the anode, and uses a platinum catalyst to facilitate the reaction. At the cathode, oxygen accepts electrons to become oxygen ions. Electrons travel in the external circuit, while the hydrogen ions are attracted to the cathode. At the cathode, oxygen ions combine with the hydrogen ions to form water. The SOFC runs hot enough to reform fuel internally. Also, it is not as sensitive to sulfur and carbon monoxide buildup as other fuel cells. At the anode of an MCFC, hydrogen is ionized by a catalyst and electrons move through the external circuit to the cathode. 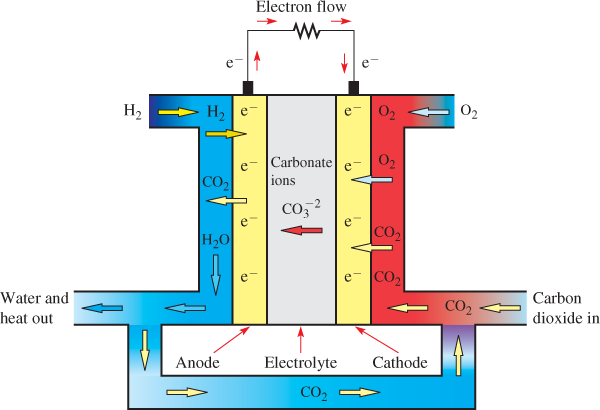 Carbon dioxide and oxygen from the air are ionized at the cathode to form carbonate ions, which travel through the solid electrolyte to the anode. At the anode, the hydrogen ions combine with the carbonate ions to form water and carbon dioxide, which is returned to the cathode.